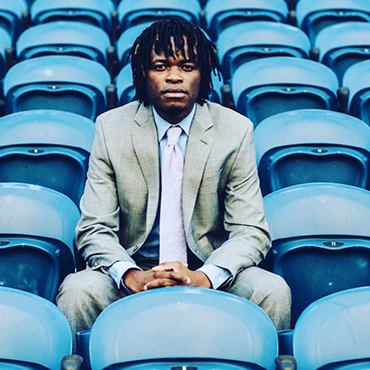 Steve Zakuani was born in the Democratic Republic of Congo, moving to London when he was four years old. His soccer career started early in life playing for the Arsenal youth academy in London for five years, then attending the University of Akron on a soccer scholarship. In 2009, Zakuani’s professional soccer career began with the Seattle Sounders FC. He was drafted by the Major League Soccer expansion club as the first pick of the first round of the 2009 MLS SuperDraft. In six years as a professional, Steve Zakuani made well over 100 appearances in MLS but his career was cut short due to injury. Since retiring from soccer, Steve has stayed involved in the game through coaching individuals and running soccer clinics. As active as he was on the field during his career, Steve was just as active off it. Steve Zakuani founded Kingdom Hope in 2010, a nonprofit whose programs inspire individuals to develop their talents and become leaders. He is also a prolific public speaker and has spoken to churches, businesses, sports teams, community groups, high schools, and universities on topics such as leadership, goal setting, teamwork, and overcoming adversity. Steve’s first book, 500 Days was released in January 2015 and it chronicles his return from a career-threatening injury to the field. When he isn’t coaching, speaking, or writing, Steve likes to travel, watch movies, and read books. He currently resides in Seattle, Washington.